Rep. Daniel Fox, D-Stamford, answers questions about the early-voting resolution. A divided state House of Representatives Thursday approved a resolution calling for a referendum on a constitutional amendment to allow early voting in Connecticut. The House voted 81 to 65 to back the amendment — with three Republicans joining 78 Democrats — but, even if the Senate concurs, the earliest that state residents might have more than a single day to cast ballots would be in 2020. That’s because 75 percent of the members in both chambers would have had to approve the proposal to place it before voters in a referendum this year. If the Senate approves the amendment, the General Assembly would have to vote for it again in 2019 or 2020 to put it on the ballot for the state election in 2020. If voters approved the amendment, legislators in the 2020 or 2021 session would consider a measure setting rules for early voting in November of that year. Early voting would give constituents options that take into account their busy, hectic schedules, said Rep. Daniel J. Fox, D-Stamford, the co-chair of the Government Administration and Elections Committee, which sent the amendment to the House floor. Republicans repeatedly called early voting an unnecessary expense for municipalities and criticized the proposal as half baked. Democrats rejected a number of changes proposed by the GOP, including one that would have scrapped the amendment and required voters to show a photo I.D. in order to vote. Currently, voters are allowed to present other forms of identification that do not include a picture. Rep. Vincent Candelora, R-North Branford, said early voting could increase voter fraud and leave constituents unable to change their vote if something unforeseen occurs close to election day. The proposed state constitutional amendment would allow at least two and up to five days of early balloting sometime during the two weeks before an election. The legislature would determine the specific days later on. Polls would be open for at least eight hours. 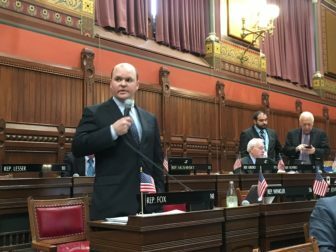 House Majority Leader Matt Ritter, D-Hartford, said the amendment also would alleviate the constitutional constraint that currently requires a voter to be outside their municipality during all polling hours to qualify for an absentee ballot. “The one that just eats at me is the man or woman who has two jobs, who works in their city and provides for their family, and our constitution says, ‘sorry you figure it out,’ but if you vote that’s fraudulent,” Ritter said. The majority leader also said people who unexpectedly get sick on election day can’t use an absentee ballot either and argued an early voting option would give people more flexibility. The House Republicans who voted for the resolution were Livvy Floren of Greenwich, Devin R. Carney of Old Saybrook and Jesse MacLachlan of Westbrook. Four legislators were absent.